New this month are two 1955 Oldsmobiles. 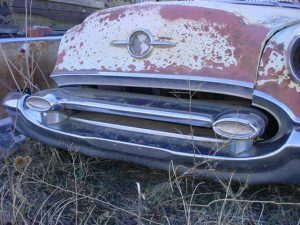 The Oldsmobile have fantastic front bumpers and grilles, and the body needs some work, but the two door hardtop fenders; door; trunk are in very workable condition. The front and rear bumpers have no hard rusting (or rotting out) the front hood and all important front hood lip moulding is in fantastic condition.